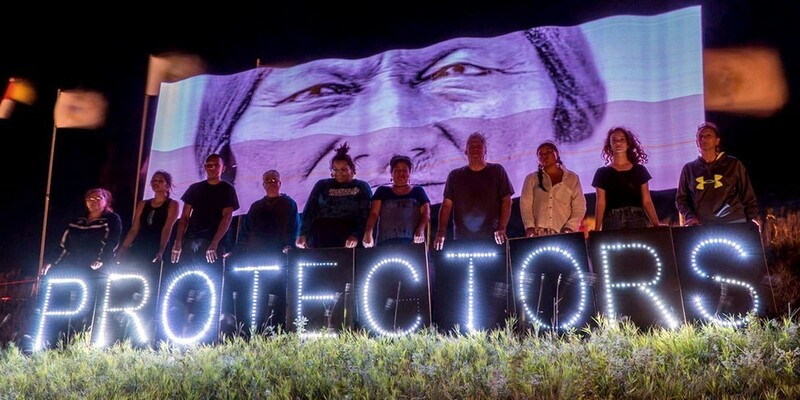 Stop the Dakota Access Pipeline! Dozens of people, many holding signs proclaiming "Water is life" or "#NoDAPL," were gathered Friday at Pioneer Courthouse Square when they learned a North Dakota tribe had lost its bid to halt construction of the controversial Dakota Access oil pipeline. A federal judge Friday had rejected a request by the Standing Rock Sioux to halt construction of the $3.8 billion, four-state pipeline. A protester arrested after allegedly chaining himself to a minivan at the intersection of 3rd and Broad Street was in court Wednesday. Peter Gibbons-Bellew was charged with inducing panic, disorderly conduct, hindering and failure to comply -- all misdemeanors. The judge set Gibbons-Bellew bond at $7500. This Thanksgiving, I'm going to Standing Rock with a delegation of more than 50 people from across the U.S. to cook and serve dinner for 500 Water Protectors, as a small way to give back to Native Americans on our national day of thanks.